The inimitable Dorothy Parker is often known more for her sharp wit and cynicism than for her actual work. As with many literary figures, Parker's life was filled with drama and personal darkness, which often came through in her writing. Parker was born Dorothy Rothschild August 22, 1893 in West End, New Jersey (now known as Long Branch) to a Jewish father and Scottish mother, J. Henry and Eliza A. (Marston) Rothschild. Dorothy had three considerably older siblings and felt lonely as a child. While the Rothschilds were a relatively affluent family, Parker recalled an unhappy childhood in later interviews. This unhappiness, along with the early deaths of her mother (who died when Parker was not yet 5), stepmother, brother (who went down with the Titanic) and father, would construct the framework for her dark cynicism and tendency toward morbid thoughts. Although her father was Jewish, Dorothy attended Catholic school until age 13, at which time she was enrolled in an exclusive private school where she discovered a love of language and literature as well as political issues and current events. She also began to write and recite poetry during this time, and was instructed on proper enunciation. In 1908 the founder of the school died, and Dorothy's formal education ended at age 14. A short time later Dorothy's father died, and she went to live in a boarding house in New York at 103rd and Broadway, working her way through the summer playing the piano at a dance school. It was during this time that she had her first poem ("Any Porch") published in Vanity Fair. She then secured a job writing captions for Vogue, where her wit began to peek through in captions such as "Brevity is the Soul of Lingerie, as the Petticoat said to the Chemise". Sensing that Dorothy required more meaty subject matter to match her incisive wit, the editors transferred her back to Vanity Fair. There she wrote a variety of features and was hired as a drama reviewer, replacing P.G. Wodehouse. Parker gained her initial recognition with her columns for the magazine as she continued writing her short stories and poems. Dorothy Rothschild married Edwin Pond Parker in 1917. Eddie Parker was a Wall Street broker from a distinguished family and a recent enlistee into the US Army. Eventually her husband was called to duty overseas and she continued her life and career in New York. In 1919 she met up with two recent hires of Vanity Fair, Robert Benchley and Robert Sherwood. She connected with the two editors instantly and had lunch with both almost daily. Parker found a mentor and friend in Benchley, who guided her by introducing her to the style of journalistic writing. These lunches with Benchley and Sherwood at the Algonquin Hotel became the basis for the now famous Algonquin Round Table. Parker continued to write for Vanity Fair and became an integral member of the Round Table, trading barbs and intellectual criticisms with her contemporaries in the New York drama and journalism circles. The group engaged in spirited battles of wit and during a game of "I Can Give You a Sentence," Parker reportedly quipped. "You can lead a horticulture, but you can't make her think." As she honed her writing skills (and her humor) in her work as drama reviewer for Vanity Fair, her reviews became more acerbic and in 1920 she was fired from this position for such outspoken criticism. Parker went on to become the drama critic for Ainslee's magazine and began submitting freelance work to Life. By this time Parker had quite a widespread reputation and experienced a span of high productivity, writing essays and sketches for publications such as Saturday Evening Post and Ladies Home Journal. She continued to be a part of the New York social scene and found herself finding acquaintances and business connections with the likes of Lillian Gish and Scott and Zelda Fitzgerald. (Note: Parker would later select the works for Viking's Portable F. Scott Fitzgerald.) At the same time, Parker began to drink heavily and her marriage to Eddie Parker (who was also an alcoholic) deteriorated. She became depressed and found it difficult to write material that pleased her. In 1922 Dorothy Parker had an affair with the emerging playwright Charles MacArthur, who it turned out was having multiple affairs with other women. Parker found herself pregnant with MacArthur's child and subsequently had an abortion. Shortly after, she first attempted suicide by slitting her wrists. This pattern of depression, affairs, suicide attempts and recovery would continue throughout Parker's life, though she still maintained high popularity and a steady workload. In 1926 Dorothy published a collection of her poems, Enough Rope which was well received by the public and critics alike. This collection included Resume, One Perfect Rose and the still-famous News Item in which Parker quipped, "Men seldom make passes/At girls who wear glasses". In the next few years, she signed on to review books for The New Yorker, a position she attained through friends from the now disbanded Round Table. She signed her columns "Constant Reader" and demonstrated yet again her sweet delivery of biting sarcasm and incisive wit. In a review of A.A. Milne's The House at Pooh Corner Parker remarked "that marks the first place in The House at Pooh Corner at which Tonstant Weader Fwowed up." It was also during this time period, as "Constant Reader", that many major events in Dorothy Parker's life and career took place. In 1927 Parker became more vocal in her socio-political opinions and she joined in the protest against the execution of Sacco and Vanzetti. (Parker was ultimately arrested and released). 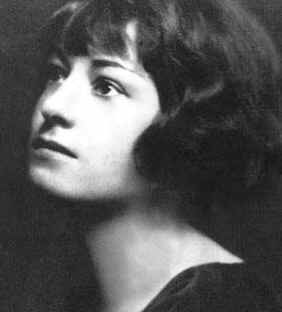 She eventually divorced Eddie Parker in 1928 and in 1929 Dorothy Parker won her first major literary award. Parker's short story "Big Blonde", which told the all too real tale of an aging party girl, won the O. Henry Memorial Prize for best short story. Over the next decade Parker was busy writing for the stage and screen. She worked with MGM and Paramount as well as for film legends Cecil B. DeMille and Irving Thalberg. Parker wrote and collaborated on many screenplays, dialogues and even popular lyrics of that time. She maintained her journalistic connections by doing freelance work for past employers and other magazines such as Harper's Bazaar and Cosmopolitan. In 1933 she met Alan Campbell, a young Broadway actor who shared Dorothy's sense of humor and interests. Campbell, eleven years her junior, shared her Jewish/Scottish heritage and was an avid fan of Parker's writing. Despite rumors that Campbell was bisexual, the two were married the following year. The couple headed to Hollywood where they teamed up to write dialogue and storylines for various film scripts. The most popular was undoubtedly A Star Is Born and their screenplay was nominated for an Academy Award. While Parker contributed to countless stage and film productions, her only film appearance is in Alfred Hitchcock's Saboteur, where she is featured in a short scene with Hitchcock. Parker's political causes gradually became more a focus of her life. She declared she was a Communist and helped to found not only the Screen Actors Guild but also the Anti-Nazi League. The Spanish Civil war was one of her most passionate interests, she wrote and spoke out in support of the Spanish Loyalists. In 1944, Viking published The Portable Dorothy Parker, which received mixed reviews. The book was a relative commercial success, but perhaps due to the world climate, Parker's work was more harshly judged by critics as being shallow and dull. In the years that followed, Parker struggled with depression and alcoholism. In 1947 Campbell and Parker divorced, but would later remarry. By 1949, Parker had been blacklisted for her political associations and eventually pleaded the First Amendment in hearings when she was asked if she were a Communist. The events in both her personal and professional life began to take their toll on Parker, as she slipped further into depression. She found writing increasingly difficult and was rarely pleased with the projects she did complete. Work was scarce, but by the mid-fifties, things took a slight turn upwards as A Star Is Born was remade, starring Judy Garland. Overall, however, it seemed as if Dorothy Parker's days of being a famous and admired wit were over. She had published several collections of poetry and short stories, in addition to her work in magazines and in Hollywood, but none seemed to match the excitement and interest that Parker attracted in her first years in New York. After many years of moving back and forth from Hollywood to New York, Dorothy returned to the city of her youth a final time in 1963, and moved into the Hotel Volney. This same year she found Alan Campbell dead of an apparent overdose. She completed a few last projects, publishing her last work in November 1964. Bitter with age and mostly blind, she is often reported to have agreed with the assessment that she had outlived her usefulness. Most of her contemporaries and friends had died years earlier, and it is ironic that a woman so drawn to pessimism, who had attempted suicide at least four times, lived into her seventies. Dorothy Parker died of a heart attack on June 7, 1967 in her room at the Hotel Volney. She willed her remaining estate to Martin Luther King Jr. and her cremated remains were eventually buried at the NAACP headquarters in Baltimore. No Responses to "Dorothy Parker"